A wine as mysterious and stately as its raven namesake. Our signature Rosé is a blend of Pinot Noir and Chardonnay. A Pinot Noir of uncommon complexity named after the swirling vortex in, "A Descent into the Maelstrom". A Limited Edition Pinot Noir Cuvee from the historic Hyland Vineyard. A Chardonnay named after the star-crossed noblewomen from Hamlet. 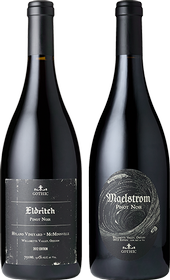 Two bottles of our best Pinot Noirs from the 2012 vintage in a black gift box: Eldritch Hyland Vineyard and Maelstrom.